We're not even halfway through 2010, and already it has been a rough year in terms of U.S. natural disasters. The recent, devastating floods in Tennessee caused an estimated $1.5 billion of damage in the Nashville region alone. The Atlantic hurricane season doesn't officially begin until June, but experts are predicting an above-average number of storms this year. And the still-young tornado season has already been filled with lethal and highly destructive events across the southern Plains states. 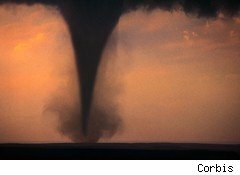 Historically, tornadoes have been particularly costly in the U.S. According to the credit rating organization A.M. Best, tornadoes and tornado-related events have been responsible for an average of nearly 57% of all catastrophic losses per year in the nation since 1953. The company says insured losses due to tornadoes and severe thunderstorms hit a record high in 2008 for the U.S. property and casualty industries. Of the 29 severe thunderstorm events that year, according to its report, two events alone "each resulted in insured losses of $1 billion or more; another four severe weather events generated losses of $725 million or more." Global insurer Swiss Re, meanwhile, notes that overall insured losses for natural catastrophes and man-made disasters in 2009 were relatively low. "The industry is therefore well advised to prepare for much higher losses," says Thomas Hess, the company's chief economist. "Given their high volatility, losses could easily be three to five times what they were in 2009. In 2005, insured losses set a record when they soared to $120 billion. I would not be surprised if this record is broken in the not too distant future." The destruction from the storm system that caused deadly tornadoes in Oklahoma earlier this month is expected to generate thousands of claims in the state. Oklahoma's insurance commissioner issued an emergency declaration soon after the disaster, allowing experienced out-of-state adjusters to come in and help expedite the claims process. Oklahoma is one of several states in America's "Tornado Alley," where catastrophic losses from twisters are priced into primary homeowner insurance policies. "That's why you typically find higher homeowners insurance premiums in states that are prone to such severe weather," says Marc Young, Oklahoma's assistant insurance commissioner, "and it's primarily not tornadoes, it's primarily the high wind and hail -- that's where you get the majority of your claims." The tornado damage in Oklahoma is going to be expensive, says Marc Young, but "our No. 1 job ... is to insure the solvency of those doing business in the state." Insurance companies, he says, "typically price for these events over three-to-five year period of time. So I don't anticipate dramatic changes. Now what would concern us is if, over a series of time ... we had a series of extreme losses." "A Roll of the Dice"
The United States averages over 1,000 tornadoes on the ground each year. Some regions with high storm damage risks have created state-sponsored insurance pools, so homeowners and businesses can afford protection against wind damage. But a rise in the number of natural disasters could mean substantial losses for the insurance industry, "and if it doesn't mean losses it certainly means repricing," says Dr. Mark Lee Levine, Director of the Franklin L. Burns School of Real Estate and Construction Management at the University of Denver. "And then they have to talk about their reserves, and how much they maintain." For insurance consumers nationwide, meanwhile, coverage is becoming more costly. A study by the National Association of Insurance Commissioners, completed late last year, said the average home owner's insurance premium rose by 2.2% in 2007 -- and that increase followed an additional 5.2% rise in 2006. Insurance companies often try to allow for particularly bad weather years, notes Dr. Levine: They talk to meteorologists and other professionals to get a sense of possible losses. But the business of insuring against natural disasters can still be a roll of the dice. "We do mortality tables in life insurance," he says, "but weather is a different issue."